Annika Clutch is a real team player who first got involved with Urban Initiatives through her company Storck USA. Since 2010 Annika jumps at every opportunity to get involved and is committed to members of our team getting to know each other better. One of Urban Initiatives’ goals is to increase collaboration between members of our team. Specifically, Annika has stepped up to coordinate quarterly happy hours for the Board, Junior Board, and staff. These are social outings that enable our supporters to get to know each other on a personal and professional level. Most importantly Annika ensures that all Junior Board events are sugary sweet with donations of delicious Storck candy and snacks. Another role Annika selflessly fills is that of an amazing volunteer. During her visits with the Jenner Work to Play team, Annika and the Storck USA team turn Friday Game Days into a fun and healthy experience. Annika leads the charge in her office getting volunteers to sign up to help make a difference in the lives of UI kids. No matter where the Jenner team is scheduled to play Annika and the Storck team are there ready to jump in and get to know the kids, not to mention be their biggest fans as they play soccer. Annika coordinates a healthy meal for the kids and their families at the end of each Volunteer Day. 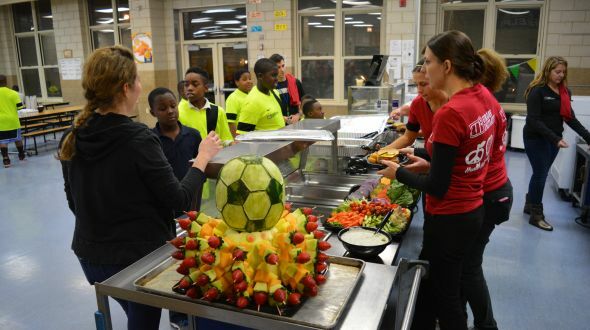 It gives our soccer players a chance to try new and healthy foods that they normally don’t have access to. Lastly, Annika has served on the Soccer Ball Host Committee. This is huge because Annika invites all of her friends to come party for a worthy cause. Many of her guests have gone on to become Urban Initiatives supporters all through the wonderful outreach by Annika. You are one of a kind Annika Clutch, we are glad you are on the UI team!